The half term holidays are over and normality can finally resume… which means slipping back into work mode! The first half term weekend had us travelling into Manchester to check out the Google Home Mini event, complete with a super cute donut truck in the Manchester Arndale. Shoppers could try their luck at winning a Google Mini… or a donut! It was a great excuse to people watch and a trip into the city wouldn’t be complete without a walk around the shops and play in the park. We even got to see the bees that had set up home in the Trees of Hope, a tribute to the victims of the Manchester Arena attack last year. Bank Holiday Monday was mainly spent roasting in Inflata Nation Manchester. I clearly didn’t realise it would be that hot upon booking! A total turnaround from the last time were there for a party, as it was previously a trampoline centre known as Jump-Nation. Now, the centre is an indoor inflatable theme park and is fabulous for big kids too! A review is to follow over on Manchester Mummy. Mid-week, we met up with the lovely Jane from A Little Lyrical and her family for a picnic lunch and catch-up at Haigh Hall Woodland Park in Wigan. How did I not know about this place, it is absolutely amazing! Featuring a woodland park, there are some fantastic grass areas to enjoy a picnic, a very funky park to play on and make room for a Holden’s ice-cream from the on-site shop. Other activities at the woodland park include adventure golf, high ropes and even golf! It was a fabulous day, with some geo-caching thrown into the mix too. Geo-caching was completely new to Liv and I, even though I was aware of it, we had never taken part… but now we are hooked! Liv now checks to see if there are any caches that can be found on our adventures out and about. Since our visit to Haigh Hall, we have gone on to find another 3 geo-caches, with many more to go! 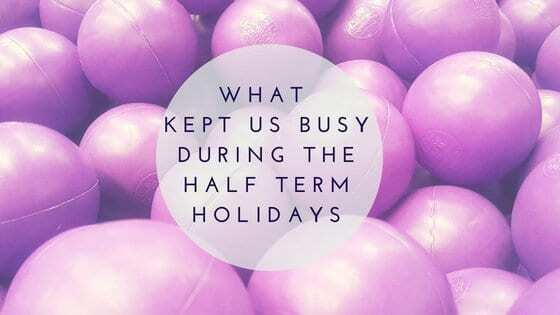 Did you enjoy the half term holidays? Are you hooked on Geo-Caching too? If Money Was No Object, What Would Be In Your Shopping Wishlist? Q&A: What Are Childcare Vouchers And How Do They Work? I’ve not seen the trees except in photos, and even that makes me cry. Such a gorgeous memorial and the bees moving in is so perfect. I love that you have discovered geo-caching. It’s always been something I thought was a great idea – we shall have to join you sometime!! Just like you, we keep so busy during the half term breaks as kids are full of energy. I love all the suggestions you have shared here as we have not been there, so I will keep this in mind for our next term break. Loved our day out! Love their faces on finding a cache too. The google thing looks great, I’m not sure which I’d want more a donut or a google mini! That donut shop looks incredible! Thanks for sharing with #TriumphantTales, we’d love to see you back again on Tuesday!